I love to use little curtains to hide junky areas. I have very cute little curtains (from Savers) covering up the recycling area in the kitchen, and have used little sink skirts in homes past. The monkey room (my office, cat HQ, and lounging area number 4) has a bank of bookshelves that I had built when I first moved in. They take up an entire wall and are quite handy for holding things. But they’re kind of unsightly. So I found some very cute (and not too dear) checkered fabric at Osgood’s the other day and sewed up these cute little curtains to hide some of the junque. 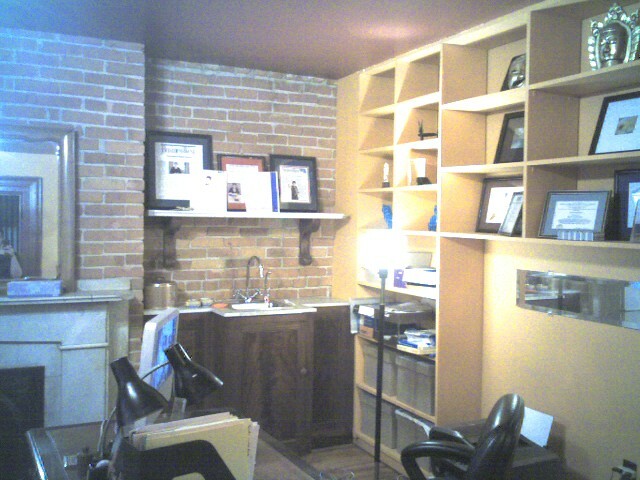 Looking at the photos, I realize that the upper shelves need to be tidied up, so I’ll tackle that this afternoon. Fabric: $21.00 (three yards at $7.00/yd), curtain rods: $10 (2 @ $5.00 each) — total cost: $31 and about 30 minutes of rod installation and sewing. A great thing about checks and stripes is that you don’t have to mark the fabric, you can just use the lines as guides, so it speeds up the process. The cats and dog all have favorite napping spots in each room. 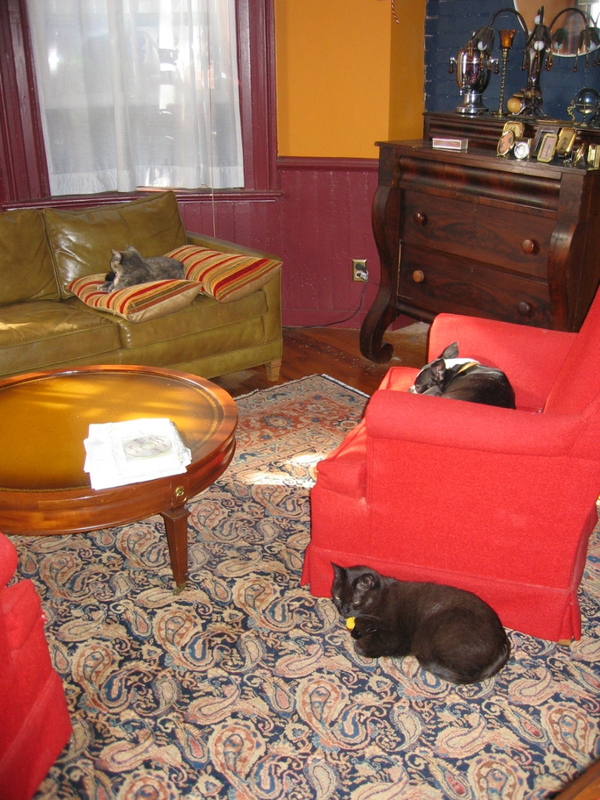 They really love to hang out in the monkey room (my office). This is them each in their favorite spots as happy as can be with sunlight and a breeze for optimal napping conditions. 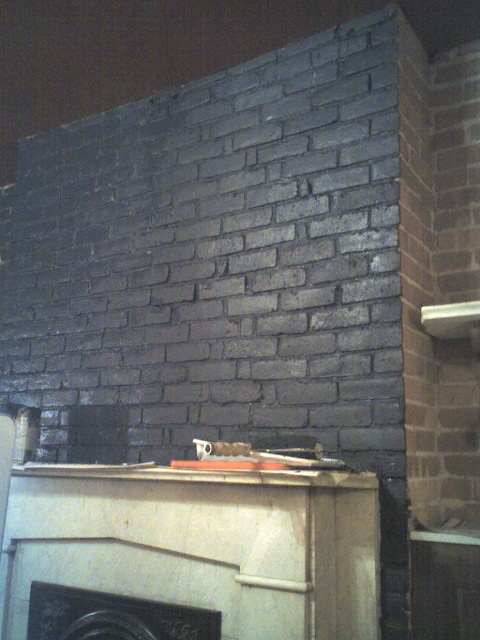 I think the painted brick looks FAB-U-LOUS! The room seems much more finished now. I love the navy color (it doesn’t come out accurately in my phone-photos). One day I’ll get a real digital camera and post some better photos. In the meantime, all my money will be going into the bathroom. The plumber has been up there for three hours now…. $$$$….. sigh. There’s a leaking pipe in my bathroom, and the plumber is going to replace a bunch of the piping up there while he has the opportunity. The floor is going to be largely opened up, so I’m making an executive decision to re-do the subfloor. We (Walchek the plumber and I) also discovered a big hidey-hole under the bathroom. It’s full of lead pipes and lumber. No gold dubloons. Anyway, I’m making use of the time I planned to be tiling the floor to instead paint the exposed brick wall in my home office. 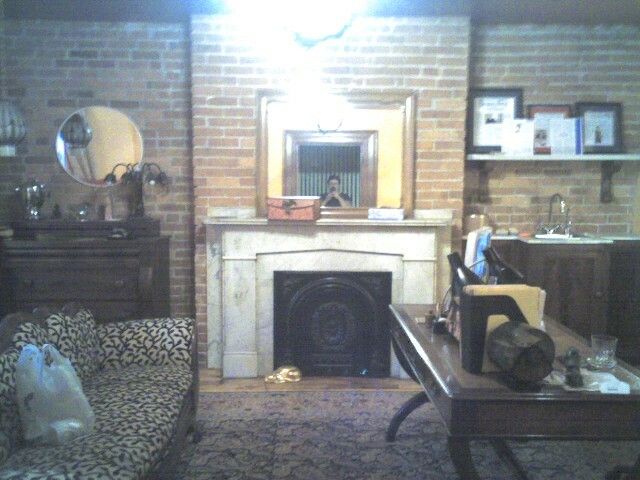 I’ve disliked the exposed brick in this room for the past eight years that I’ve lived here. I’ve wanted since day one to put up a plaster or drywall wall and paper it with a really neat wallpaper that has a black background and pastel-colored monkeys and hot air balloons. But I simply can’t afford that at the mo’. What I can afford is a can of paint, so I’m painting it. I got a really cheap can of paint – $30.50 – Behr’s paint and primer all in one, flat interior paint, in Starless Night, a dark blue. Here’s the progress so far. I think it looks FABULOUS. I’m hoping to finish painting tonight, but I’m getting kind of tired, so it might be tomorrow. It needs two coats and even though I got a super deep nap roller, it requires a lot of brush work to get into the mortar. 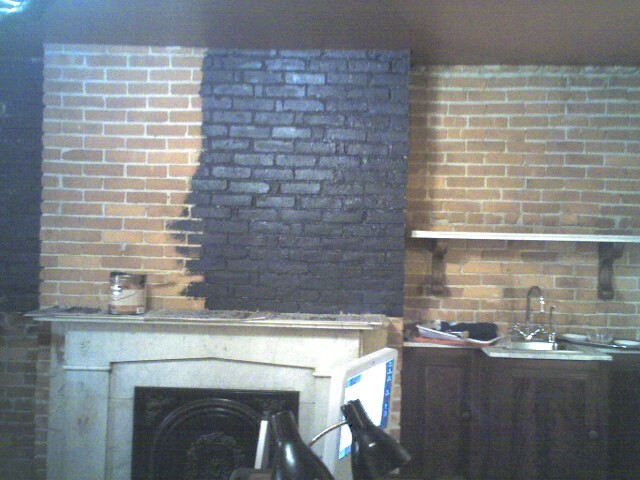 I know people have strong feelings about painting brick. 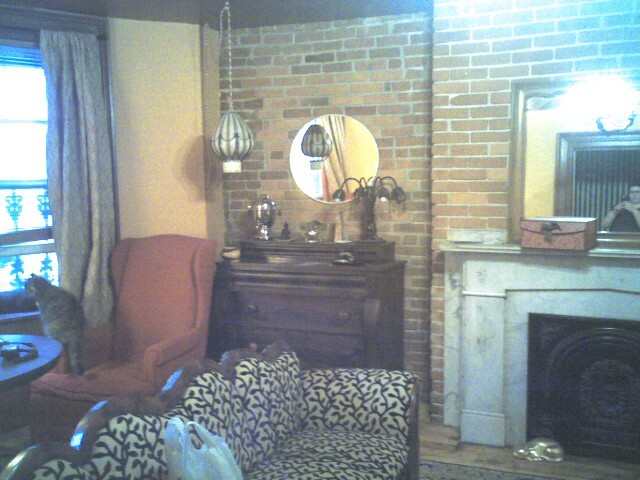 This was never meant to be exposed (someone knocked down the wall at some point in the 1980’s when exposed brick was all the rage), and I’ve always thought it didn’t fit with the elegant marble fireplace and generally finished look of the room. I really think the painted brick looks much better in this setting. 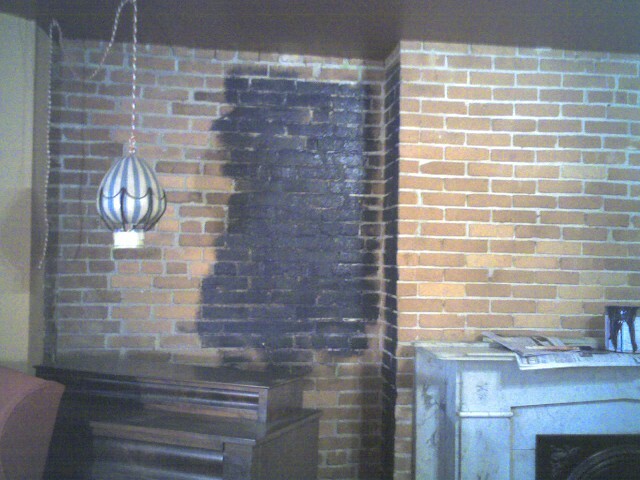 The brick was old and dirty and flaky, and this looks much cleaner, too. I’m giving up on restoring the wood in my bathroom. I spent about six years a week working on this one section, and it’s just so damaged that there’s no way to make the wood look good. Boo hoo. I really wanted the gorgeous amber glow of this wood to envelop me as I bathed, but there we are. The new plan is to finish sanding the wood to paint-able levels (MUCH less work), and paint it a nice gray with blush walls and ceiling. I’m trying to find a handyman to do much of the work, because I’m kind of over the whole thing. But I still ain’t got the funds to do it, so we’ll just see what happens next. I continue to be unemployed and bored, so am trying to do no-cost projects. I got this rather fabulous (and surprisingly heavy) papier-mache balloon at Savers a while ago, and got the red and gold braid specifically for it. I tried installing it with a variety of cup-hooks, but the balloon kept crashing to the ground. So I borrowed a much more substantial toggle-bolt ceiling plant hook from a friend and put it up with Jerome’s supervision (he’s just completed some OSHA training). The braid looks hideous, so I’m going to root around in my wrapping paper collection for some nice fabric ribbon that I could use instead (and the braid is also clearly too short. I do love the look (except for the braid). I’m imagining the brick wall covered up with real wall and papered in this fabulous wallpaper I’ve seen that is a matte black with vibrant monkeys, hot-air balloons, and other circus-folk. If/when I get a job, the wall will be a top priority. So Jerome probably weighs around 15lbs, the balloon weighs about 2lbs, and the hook is supposed to hold 40 pounds. So even if he takes a flying leap and the balloon, I think it will hold and NOT bring down the entire ceiling. But I guess we’ll just wait and see. When I first moved into my house, I was co-owner of a web-design business, and we decided to locate it in this room of my house. The company folded 😦 and I eventually made the room into a bar. I stopped drinking a few years ago, and am curtailing large parties that need a full bar to be a party, so I decided to turn the room back into an office for my accent modification business. 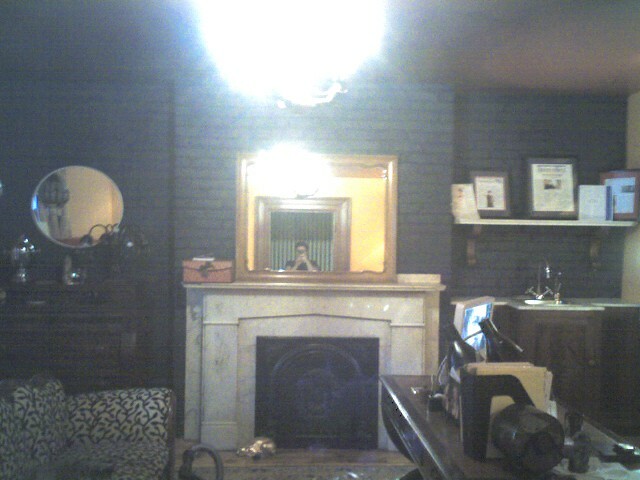 Like all the other rooms in my house, it was 100% white when I moved in (well, except for the brick wall). Hard to find any white today. I can’t find any early early photos (so sad to have lost all of those with the loss of the computer…), but there are some photos from when it was a bar on this site. So here it is today. I had the big ungainly radiator removed and replaced with a daintier model from the basement. Just painted the big white spot (the paint is still wet!). It’s so hard to take photos in this room because it’s on the darkish side (just the way I like it). The colors are quite lovely, but they do look rather garish in the flash. 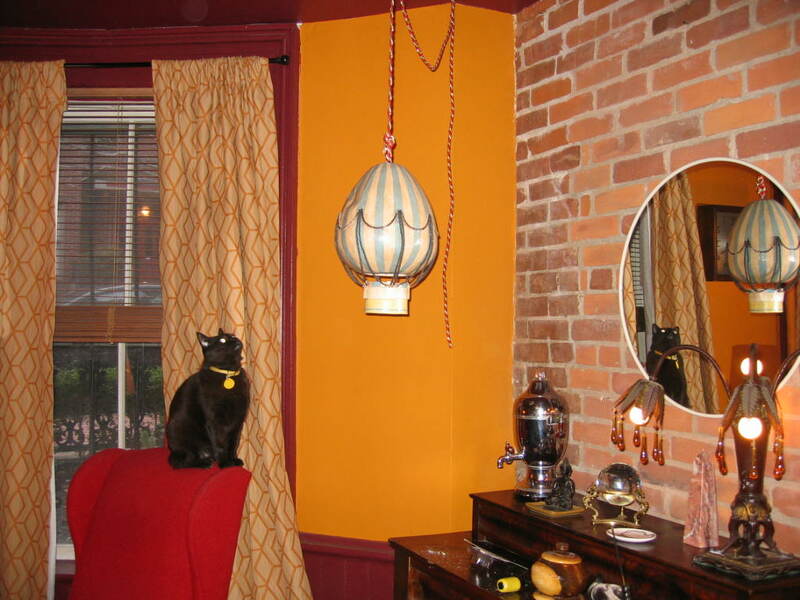 Some of the highlights of this room: drapes — I got the fabric at a going out of business sale for about $10.00. Monkey chandelier and sconces. Sink (from bar days) designed and built by New England School of Architectural Woodworking students. Marble shelf over bar is an old fireplace mantel bought at a salvage yard, and marble sink top was pieced together out of marble scraps; Italian faucet and basin from ebay. Fabulous couch was a free gift from a neighbor who didn’t want to pay for reupholstering it (it was scratched up 1980’s green ick). The reupholstering (it’s velvet on the black parts — very rich) was pricey, but worth it. Red wing chairs cost $10 each at a thrift store. Fabulous desk was $100 on ebay. Maybe I’m a Batman villian? The room isn’t really crooked. During: new radiator is in, showing how white the wall was. Eeek!